Driving long stretches of highway on road trips can be exhausting for the driver. Luckily, most modern vehicles are equipped with cruise control. Cruise control is helpful in relieving some of the exhaustion related to long-distance driving as well as maintaining a consistent speed which could be very useful for lead-foot drivers. Learn about cruise control and best practices for using this handy feature before your next long-distance road trip. Imagine driving across the whole country, coast to coast. Now, imagine doing so without cruise control. Sounds pretty tiring, doesn’t it? When you’re cruising on the open road, cruise control helps to ease the sometimes foot-fatigue experienced among drivers. The cruise control system locks the gas pedal into a certain position to maintain the driver’s current speed. In older vehicles the system varied greatly than today’s modern vehicles; an electric vacuum pod was mounted under the hood connected to the accelerator cable. When enabled, the vacuum pod would keep the accelerator in the same position as the speed set when the cruise control was established. Newer vehicles, though, are no longer equipped with accelerator cables. Instead, they contain a wireless system that communicates with the internal computer. The car’s computer identifies the vehicle’s speed and the cruise control module maintains the existing speed. The best time to utilize your cruise control feature is on highways where speed limits range from 55 to 75 miles per hour. To initiate your cruise control system, begin by selecting the cruise on/off buttons on your vehicle. Most often, the controls are located on the steering wheel itself or mounted on the turn signal lever. (Tip: For safety purposes, familiarize yourself with this option prior to driving.) Once you reach the desired speed, press the ‘SET’ button. A light on the dashboard will come on indicating the cruise control system has been activated. Slowly take your foot off the accelerator. If the vehicle maintains the current speed, you have successfully turned on your cruise control. If you’d like to increase the vehicle’s speed, simply press the accel/+ button. To decrease speed, press the coast/decel button. (Note: each vehicle’s buttons are labeled differently. Check your owner’s manual to determine your vehicle’s design.) Both the increase and decrease speed options, when activated, will adjust by 1 MPH. To disengage cruise control entirely, lightly tap the brake pedal. To re-engage your last cruising speed, press the ‘RES’ or resume button. To discontinue the cruise control feature, place cruise control in the OFF position. 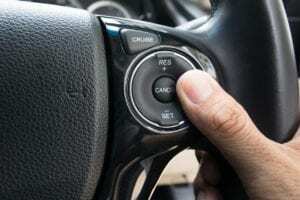 Though cruise control is an effective and helpful tool for long-distance driving, there are times when drivers should forgo using the option all together. Here are some Dos and Don’ts when it comes to using your cruise control. DON’T use in wet weather. Whether rain or snow, avoid using your cruise control. That’s because when enabled, it may cause your car’s tires to lose contact with the road, putting you at risk of hydroplaning. DON’T use when fatigued. Though not having to keep your foot on the accelerator is comfortable for some, being able to relax their legs while driving and not having to monitor speed constantly increases the possibility of becoming fatigued at the wheel. DON’T take your hands off the steering wheel. While your car is maintaining speed using cruise control, it does not to maintain the path you are taking. Road levels and terrain vary and could affect your vehicle’s course. Keep your hands on the steering wheel to stay between the lines. DO keep your feet near the accelerator and brake pedals. In case you need to increase speed or come to a fast stop, you’ll need to act quickly. Having your feet near the pedals helps to accomplish a faster reaction time. DO be aware of your surroundings. Even though your car is doing the work, you’ll still need to keep eyes and ears focused on the road and avoid distractions. DO keep a safe distance from other cars. Not all cars are equipped with adaptive cruise control or the ability to automatically keep a safe distance from other cars. You must make a conscious effort to keep a safe distance. Cruise control is a system that is unable to be maintained and unfortunately, there are no indicators that cruise control has failed until you attempt to enable it. Most often cruise control fails in older vehicles due to the engagement buttons or the vacuum pod. In newer, wireless systems, a module or switch is often to blame. A qualified ASE Certified Technician can help determine the cause and restore your cruise control’s function so your next road trip will be a breeze!